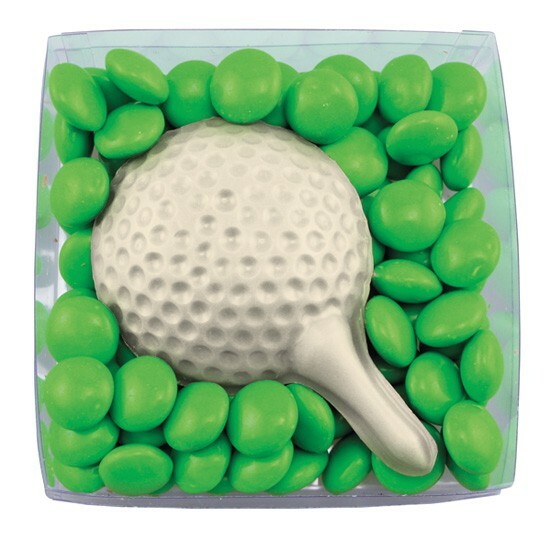 Hit the green with this golf theme box. Great for corporate golf events, benefits, or any other sports or golf related promotion! 3.84 oz Clear box filled with 2.9 oz Colorific chocolate candy Bites (compare to M&M''s) and one chocolate candy golf ball on a tee. Colorific chocolate candy Bites available in a variety of colors in milk chocolate candy only. Golf ball on a tee available in all four flavors. Coordinate the ribbon to match your corporate or theme colors. Price includes 4 color label applied to the box. 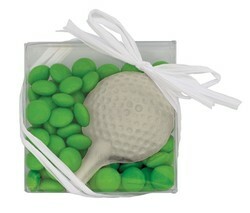 Makes a great food gift or golf sporting event promotional giveaway.